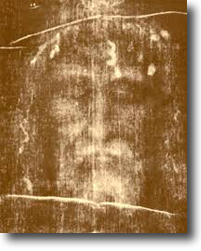 The Shroud of Turin is a centuries old linen cloth that bears the image of a crucified man. A man that millions believe to be Jesus of Nazareth. Is it really the cloth that wrapped his crucified body, or is it simply a medieval forgery, a hoax perpetrated by some clever artist? Modern science has completed hundreds of thousands of hours of detailed study and intense research on the Shroud. It is, in fact, the single most studied artifact in human history, and we know more about it today than we ever have before. And yet, the controversy still rages. We believe that if you have access to the facts, you can make up your own mind about the Shroud. Join us this Wednesday where Lee Sweeney will talk about current and past research on the fascinating Shroud of Turin, and draw your own conclusion... is this the Face of the God of the Universe? Lee Sweeney is the Director of The Shroud Center of Southern California, a scientific research and exhibit center that conducts advanced studies on the Shroud of Turin. Founded in 1996 by August Accetta M.D., the Shroud Center is staffed by ecumenical team of professionals with expertise in medicine, physics, nuclear imaging, biology, pathology, history and art. Shroud Center Docents are regularly invited to present the latest Shroud evidence to churches, RCIA classes, high school science classes, and college comparative religion classes. Lee joined the Shroud Center in 2003 and has been studying the Shroud for over 20 years. Outside of his Shroud studies, he is currently General Manager of ACG Technologies, a custom software and digital marketing consulting firm in Rancho Santa Margarita. Lee combines his art history education and technology experience to approach the Shroud as an unparalleled artistic, historical and technological mystery. Lee is active in a variety of religious and civic organizations including Orange County Jail and Homeless Ministries, Rancho Santa Margarita Chamber of Commerce, and the International Society for Performance Improvement (ISPI). Lee and his wife Michele live in Orange and have three college-career age daughters.